Sitrex QR Rakes » Darrell Harp Enterprises, Inc. 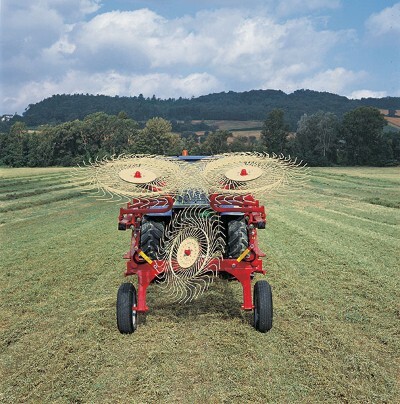 This "V" type wheel rake gives farmers the opportunity to use a machine featuring high performance in terms of both quality and quantity, combined with simplicity of use. The machine is compact, but designed at the the time with plenty of clearance in the area through which the raked hay goes through. This gives the machine excellent operational qualities as well as maneuverability and stability both while working and during transport. 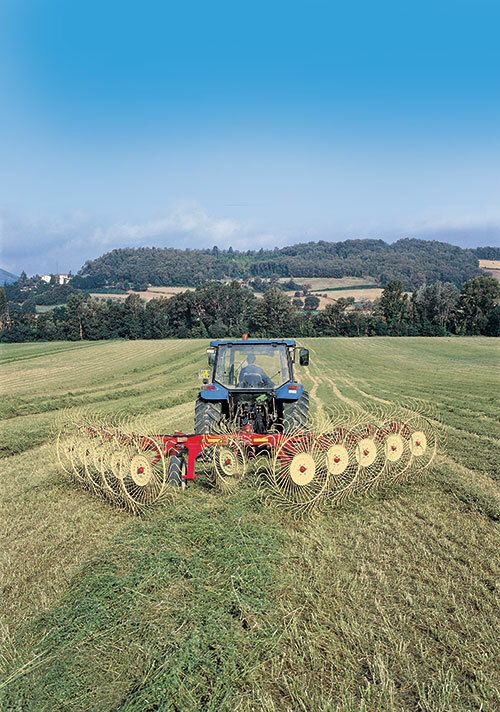 Thanks to the quality of materials used and to the solutions adopted based on experience acquired in innumerable field tests, the QR Rake will meet farmers' every need, with regard to functions and durability. The sections of the raking wheels can be folded horizontally over the carriage, since there is a special hinge tilted on two axles that enables direct switching from the working position to the transport position with no need for any manual action. 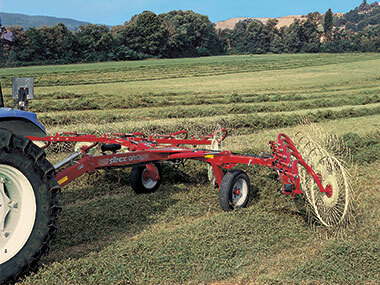 This arrangement also means that the overall dimensions of the machine are limited and that it can be stabilized. The arms of the rake are secured by means of tie-rods in a safe position for transport. 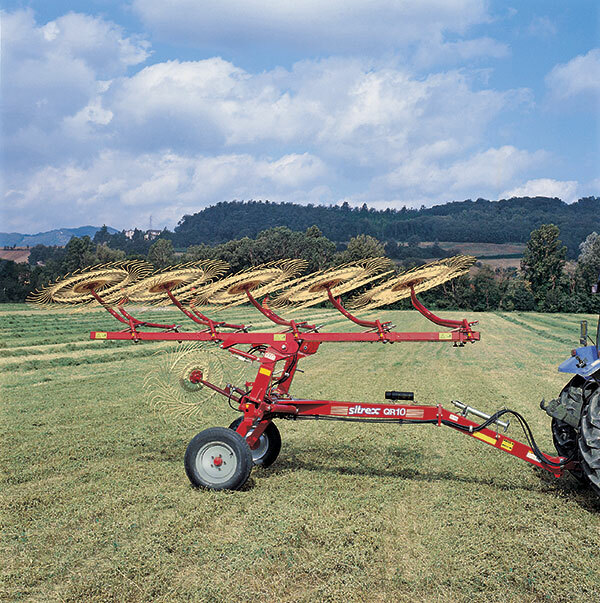 The tie-rods also enable selection, when required, of the raking arms to be used for working either on the right or left, along embankments or fencing, and to switch from forming the windrows on the right or left as required. ALL THIS CAN BE DONE WITHOUT REMOVING OR ADDING ANY COMPONENTS. All the adjustments to the working width and to the windrow width can be made simply and quickly without removing or adding any components. A precise system of shock absorbers on the rake arms and a system for oscillating the raking wheel holders enable the machine to adapt to uneven terrain. The strong frame made of structural tubular metal and equipped with 15" tires ensures stability of the machine and durability even in tough working conditions. ALL THIS MEANS EXCELLENT QUALITY OF THE WORK FROM EVERY POINT OF VIEW.